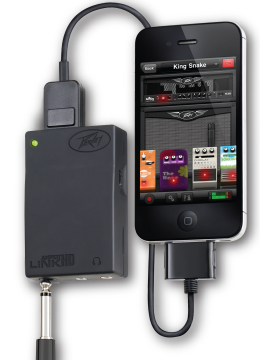 Great for plugging your guitar directly into your iPad, iPhone, and Android devices that support USB On-the-go. It only does one thing, but it does it well - it digitizes your guitar signal and sends it to your iOS device. Well technically I guess you could say it does two things because it comes bundled with the free AmpKit App which was developed by Agile Partners specifically for the AmpKit LiNK HD. The App includes amp and cab models of Peavey amps as well as other brands such as Marshall and you can buy more as in-app purchases, or you can buy the pro version of the app AmpKit + (which also has in-app purchases). The app also has a range of effects you can buy as well. You can get the complete specs for the App at iTunes. Well technically, I guess you could say it does three things because it's also USB 2.0 compatible and comes with a cable you can use to plug it into your Mac or Windows PC, however if you're only looking to use it with desktops or laptops then I'd recommend getting a full audio interface so you can record with other instruments and microphones - something you can't to with this device due to its high input impedance designed specifically for electric guitar.. The A/D converter works at 24-bits and supports sampling rates of 44.1/48 kHz. It has an optional power supply so you don't drain the batteries of your iOS device while using it - better still it will recharge your iPad or iPhone while you play. The multicolor LED on the front lets you know if you're clipping and need to lower the input gain. It has a headphone output with volume control along with a line out. The sockets are made from metal - some competing products use less durable plastic. It's best suited to live performance with amp & cab simulations along with effects. It's also quite an acceptable unit for recording demos, but if you're going to be recording for commercial release then I recommend getting a full audio interface with a 96kHz sampling rate instead. Doesn't suffer from the noise problems some of its unpowered competitors have. In my opinion its A/D D/A converters are superior to the ones built into the iPhone resulting in better quality audio than the iRig. The line out let's you send a signal to an amp or PA while using headphones at the same time. If you have a newer iOS device like the iPad mini or iPhone 5 you will also need to buy a Lightning 30-Pin adapter. All the markings and labels are pressed into the rubberized surface making them hard to read on dimly lit stages (you'll have to memorize them). For about $20 more than the price of the AmpKit LiNK HD you can get a full audio interface, like the iTrack Solo with iOS connectivity.